Carry cold cans in upcycled style with this holder that attaches to your frame. Who can forget the spectacular can crash of 2016? They lived to tell about it, but their cold cans were popping and fizzing all over Route 33. Carry those beverages in safe, upcycled style with this can holder that attaches to your frame. Inspired by his high school job in a bike shop, Davidson Lewis has been incorporating bicycle inner tubes back into distinctive cycling designs ever since. 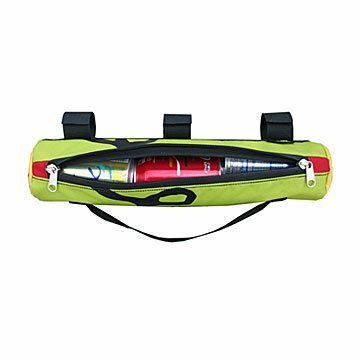 Made from reclaimed tube material and upcycled tent fabric, the insulating sleeve holds three cans and includes a shoulder strap for toting your refreshments on foot. Due to the upcycled nature of this design, colors and patterns will vary. Handmade in Boulder, Colorado. Cool idea. Better than just water bottle holder. It's awesome! What a great idea, we love it!